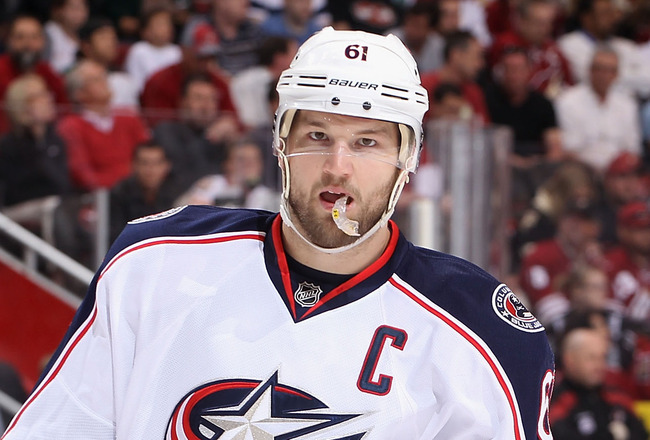 Since February, the NHL world has been watching and waiting for Rick Nash to be traded. The trade deadline came and went, Nash was still in Columbus. The NHL Draft came and went, Nash was still a part of the Blue Jackets. The NHL Free Agency came and went, and Nash had not been moved. Well the wait is finally over, and Nash’s new home will be in New York where he will play for the Rangers. In return, the Blue Jackets acquired forwards, Artem Anisimov and Brandon Dubinsky, defenseman, Tim Erixon and the Rangers’ first-round pick in the 2013 Draft. This trade comes at the end of what seemed like an eternity of waiting and countless rumors of possible destinations and chips in play for Nash. One continuous problem throughout all those rumors was the apparent asking price by Blue Jackets General Manager Scott Howson for the former Blue Jackets’ captain. If a high asking price is what was apparently keeping this trade from happening for so long, this big finale to the Nash drama was a little anti-climactic. In each scenario that made its way to the World Wide Web, via Twitter or the Blogosphere, reports were that Howson was getting shot down because he was asking for future stars from each team on Nashs’ list of teams that he would move his no trade clause for. Even when this trade began to take shape, and the pieces were coming together on who would be leaving New York, Rangers fans were holding their breath in hopes that young talent like Chris Kreider, Michael Del Zotto or Derek Stepan would not be dawning a Blue Jackets jersey next season. But instead, the Blue Jackets traded away the face of their franchise, for some decent young talent and pieces to continue to rebuild. An interesting term, rebuild. Should this stage in the Blue Jackets history even have such a label, a rebuild suggests that there was once a stable foundation, something that has never been present in Columbus. The Blue Jackets do have three first-round draft picks in 2013, their own, and one from the Rangers and Los Angeles Kings. So, the future may be better for those that have endured the grueling experience that is following the Blue Jackets. But, is that future, where the Blue Jackets crops finally bloom and are a stable winning machine in the NHL closer now? Will that future even take place in Columbus? Will Howson even be around to see this Blue Jackets team evolve? We will have to wait and see. But one thing is for sure, Nash has moved on and will be a Ranger next season, and now we wait and watch how Columbus will move on into the post Nash era.